Self catering accommodation set majestically in Hoekwil at Wilderness on the Garden Route. Toorbos is the perfect destination for family holidays in our unspoiled nature setting. Enjoy a cruise in your own small boat or do some catch-and-release bass fishing. Fully equipped cottages situated on the water’s edge sleeps 4-6 guests each. This is country living at its most genuine. The four cottages occupy a quiet corner of our 86 hectare Toorbos farm, overlooking a large dam and some of our 60 hectares of macadamia orchards, the ideal place for family holidays. 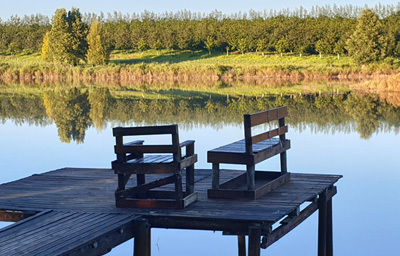 Rest and relax on your own wooden deck, take time out on the dam for a spot of catch-and-release bass fishing, enjoy walking or mountain biking on the farm or in the surrounding forests and countryside. Take a quick drive to the quiet of Wilderness’ endless, almost-deserted beaches and award winning restaurants or experience the excitement and glitz of to the Garden Route Mall in George. 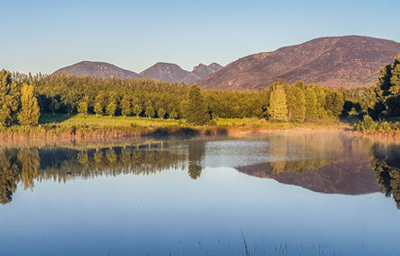 Toorbos set in unspoiled nature, is the perfect destination for the family holidays. With amazing views the cozy wooden cottages are private and right on the water’s edge. 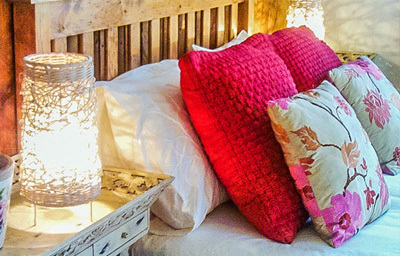 Cottages are tastefully furnished and equipped with crisp linen and soft towels. All Toorbos Cottages are en-suit and sleep 4-6 guests each. Fully equipped with utensils and kitchen appliances, televisions in all the lounges and outdoor braai areas with extra gas barbecues. Come visit us for relaxation and fun! Explore hiking trails, go mountain biking or take a stroll through the macadamia trees. Relax on your jetty with a sun-downer, enjoy a cruise in your own small boat. Do some catch-and-release fishing with the supplied rods or simply admire the bird life. ‎I just want to say thank you for such a wonderful stay! The chalets truly are the best we have ever stayed at – they are 5 star. We will definitely be recommending Toorbos.